Remember to vote for us. This is our first weekly patch. We've decided that we'll begin having weekly maintenance on Tuesdays, and if there is any content ready to apply in a patch, then it will be applied while down. -Recently, we performed our first character transfer. Right now we're doing this on a case by case basis. If you, for some reason, believe you need this service. Contact us in our ticket support system for more information and a quote. -Custom Title Purchase has returned! You can pick your own color and text. I don't know the maximum length but I'll find out for you soon! Soon, you will be issued one free revision, just in case the title doesn't look the way you want it to. -All previously purchased Custom Titles will be issued a free revision soon. Custom title price has not changed, but the method of delivery has. We have built a new system that will speed up delivery and improve tracking of the Custom Title you order. -Soon, we will begin to issue custom titles with backgrounds and art like this one: . -Multiple changes to the website including improved mail logs, event system changes, and preparation for new features. -More sale functions added to website. -Fixed issue with email confirmation for changing email address. 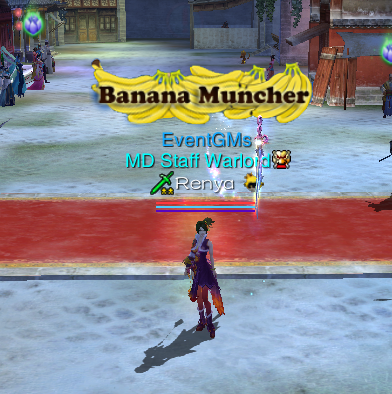 -Banana Coupons have been added to the Banana Shop in denominations of 150, 250, 500, and 1000. -Daily Sign-in Rewards will restart again on the 21st at 00:00. The rewards have not changed, but the cost for late sign-in has been reduced from 420 Jaden to 50 Jaden. -The automated PvP events were temporarily moved to Billows, and will soon be moved to Doom Bog as suggested. Thank you for your continued feedback while we improve this feature. -You can now port to the Clouded Kunlun map from most Skylords. -There is now an item in the marketplace called "Clouded Kunlun Charm" that costs 1 Jaden, when used it will port you directly to the Monkey PvP map on the realm you're on. -Significant changes were made to the drop rates and drop lists for the mobs. There were too many items being dropped to pick up and this resulted in many items left on the ground spread across the server. Most of the items were available via marketplace or otherwise unnecessary for drops so they have been removed from drop lists and the drop rates have been recalibrated to make it more likely that you can pick up all the items before the next set of mobs arrives. -Overlord of Chaos has a new custom drop list. All Elysium bosses are undergoing continued changes to their drop lists. -God of Rain's drop lists have been edited with improved drops. -You will now receive greatly increased Star Soul XP in Garro. -The marketplace has been re-organized to prepare for new items that will be added in future patches. Hopefully, this will also help make it easier to navigate the marketplace. -The "New" section will now be used for items that have been added to the marketplace within the last month. -The "Promo" section will now carry weekly promos on various items in the marketplace. As we will be restarting the server weekly, we will also be making minor changes to the marketplace as well. -The "Remedy" section has been moved to the "Item" section. A subsection has been created for all health, spirit, and vigor remedies. -A new section has been added. "Character" will contain most character related items. -Affinity Bead has been added to the "Affinity" subsection found under "Character". -The "Fashion" section has been renamed to "Cosmetic" and the "Smiley" subsection has been moved into the "Cosmetic" section. -The Goat fashion has returned. You can find it under "Cosmetic">"Set". -Monkey Drops and Monkey Flask has returned! Monkey Drops heal 3x the amount that Celestial Health Orbs do on first healing, and then 6x their amount on the 2nd, 3rd, and 4th. Monkey Flask does the same for Spirit recovery. They can be found at "item">"Remedy". -The "VIP" subsection has moved from the "Item" section to the "Popular" section with the other packs. -Items that can be purchased in bulk will be found on the "Popular">"Bulk Item" section. These items will have bonus reward items when you purchase. -The "Material" section has been renamed to "Esper/Soul" and contains all items related to "Esper", "Soul Card", "SoulStone", and "Soul Star" that are currently added to the marketplace. Some of these sections will be added on future patches with new items that are released in upcoming patches. -Anan and Bilu pets have been readded to the marketplace. -Ink Horse has returned to the "Mount" section. -Wine of Wisdom and HP equivalent were removed from the marketplace due to uselessness. -Celestial Spirit Dew and Celestial Health Orb were reduced from 1 Jaden to .5 Jaden in Marketplace. -Added Clouded Kunlun Charm to the marketplace. -BL or EL can now be done twice a day, or once each. -Level 9 EL does not award level 5 books anymore, only level 6. Also, it does not reward level 4 or 5 Reforge items, only level 6. Rates from lower rate items have been converted into the rate for the higher level items. This currently only applies to level 9 EL, so far. --Added Ice Orb of Vastness instead of TPP and increased rate x100. --Changed Affinity Beads to the tradeable version and increased rate x10. --Changed Chroma Beads to the tradeable version and increased rate x10. --Doubled the amount of Celesphere Sand level 1 you receive. --Doubled the amount of Celesphere Sand level 2 you receive and increased the rate from 50% to 100%. --Doubled the amount of Halcyon Red Crystal you receive and increased the rate from 50% to 100%. --Doubled the chance of receiving a Bright Green Crystal from 12% to 24% and there is also a chance you receive up to 2 Crystals. --Added a chance to receive the Sapphire Blue Crystal of 10%. --Added Star Weave Vigor x1. --Doubled the amount of Celesphere Sand level 2 you receive. --Doubled the amount of Celesphere Sand level 3 you receive and increased the rate from 25% to 50%. --Doubled the amount of Halcyon Red Crystal you receive. --Doubled the amount of Bright Green Crystal you receive and increased the rate from 25% to 50%. --You may now receive double the amount of Sapphire Blue Crystals and the rate has been corrected from 50% to 20%. --There is now a 10% chance of receiving a Heart of Radiance. --Added Star Weave Vigor x2. --Quadrupled the amount of Celesphere Sand level 2 you receive. --Doubled the amount of Celesphere Sand level 3 you receive and increased the rate from 50% to 100%. --Doubled the amount of Celesphere Sand level 4 you receive and increased the rate from 40% to 80%. --There is a chance you will receive double the amount of Celesphere Sand level 5 and increased rate from 30% to 60%. --Doubled the amount of Bright Green Crystal you receive and increased the rate from 50% to 100%. --Doubled the amount of Sapphire Blue Crystals and increased rate from 15% to 30%. --You may now receive double the amount of Heart of Radiance and increased rate from 10% to 20%. --There is now a 5% chance you will receive a Golden Grit. --Added Star Weave Vigor x3. --Doubled the amount of Celesphere Sand level 3 you receive. --Doubled the amount of Celesphere Sand level 4 you receive and increased the rate from 80% to 100%. --Doubled the amount of Celesphere Sand level 5 you receive and increased the rate from 60% to 100%. --Doubled the amount of Bright Green Crystal you receive. --Doubled the amount of Sapphire Blue Crystals and increased rate from 20% to 40%. --Doubled the amount of Heart of Radiance and increased rate from 8% to 16%. --Corrected improved Heart of Radiance rate from 16% to 30%. --You may now receive double the amount of Golden Grit and rate has been increased from 5% to 10%. --Doubled the amount of Star Weave Vigor you receive. -Changed Skytouch Jade stack amount to 30,000. -Significant changes were made to the GM NPC giving GMs better access to event rewards. -Changed the prize "Dragon Muscle Pack" in any lotto that had it to "Ancient Coin Pack". -New item Fate Blood's Orb added. This will be used to exchange for Fate's Blood, similar to Sigil Shards. -We also added a new item called "Bodhi Seed's Fragment" for the same purpose, but for Bodhi Seed, of course. Submit a ticket at www.monkeydynasty.org/support for help. You may not vote on more than one account in a 12 hour period. Grinding garro actually feels good now! Next week If possible, could we get stacking packs for fatecharm fragments, heaven dragon seals, soul ash and spiritual covenants? That would be a much appreciated QoL addition. i really like these changes! Good work MD team! Honestly this update affected me negatively, since to be felkin mode and only kill with bleeds, that healing potions is absurd. The rest was very good, but that detail of the potions if you can do something I would appreciate it very much. Any possibility to return old lotto's such as Dancing Snake? Beast Lord still needs a new more buffs with regards to accessory upgrade items. Though we can do the instance twice a day, the quest that gives the items can only be turned in once. Also, the reward is way too low, and random, and it will take several months too upgrade a single set at the current rate. Page created in 0.014 seconds with 20 queries.